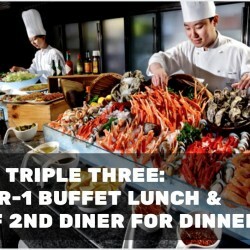 Embark on an authentic Hokkaido culinary adventure at Triple Three this October! 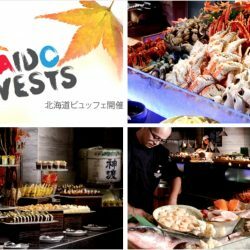 In addition to the freshest seafood such as cod fish, salmon, scallop and king crab, the buffet selection also features Japanese wagyu beef, robatayaki and ramen. Round up the experience with sensational assorted Hokkaido desserts to complete this decadent feast. 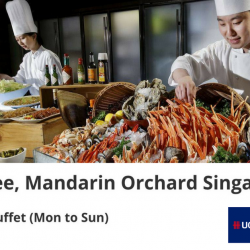 DBS/POSB Cardmembers enjoy 50% off every second adult diner! 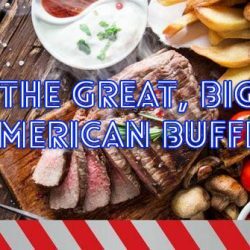 Celebrate all things American this July at Triple Three as they bring back your favourite American dishes for ten days only! Relish on roast U.S. prime ribs, baked bourbon glazed ham, cowboy steaks, crab cakes, Maryland soft shell crabs, grilled scallops, grilled steamed Boston lobsters, and so much more! 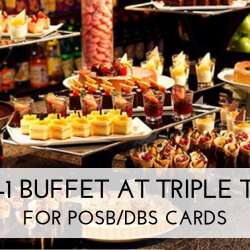 DBS/POSB Cardmembers enjoy 50% off every second adult diner. Make your reservations now! 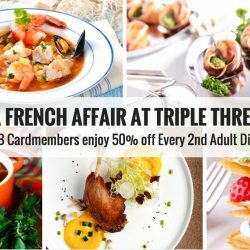 Say salut to luscious French cuisine as Triple Three brings back the popular French Affair in May, in conjunction with the Voilah! French festival. Expect signature delights such as Cote de Boeuf, Filet Mignon, Seafood Bouillabaisse, Salmon en Croute, Escargot, Pan Seared Foie Gras, various cheeses and decadent desserts such as Creme Brulee, Mille-Feuille, Madeleines, Canele, and Clafoutis. UOB Cardmembers enjoy 50% off every second adult diner so make your reservations now! Available for dinner and Sunday brunch from 19 to 29 May 2016.